Music therapy is a form of psychotherapeutic rehabilitation and treatment where different elements of music (rhythm, harmony, melody, tone, intensity, etc.) are used as key tools for interaction. 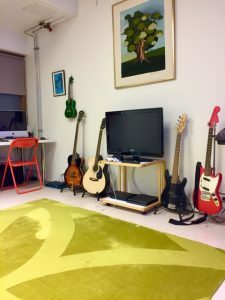 Music therapy consists individual goals and is proceeded systematically together with the client, therapist, and the sectors participating the client’s wellbeing in pursuit of a common goal. 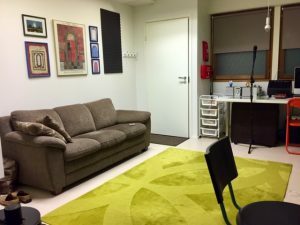 In music therapy, a unique action plan is drawn up with the client and other actors. The aim of the goals and the action plan is to improve the client’s ability to work and to participate and to better cope in everyday life. The premises are located in the center of Rovaniemi, in a building called “Tiimitalo”, where there is also located other healthcare companies and parts of the City Health Center. The facilities are on the ground floor on the courtyard side and can be accessed easily. There is a set of equipment for various methods of music therapy, instruments for rehabilitating creativity and visual expression. 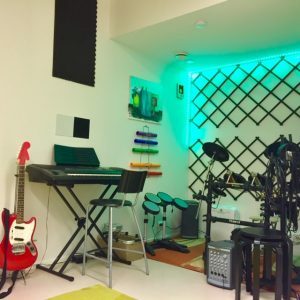 There are tools for therapy through play and games, instruments for producing and experiencing rhythm and harmony, and for psychic process through auditive listening.